There is no substitute for previous experience in new markets. Build management teams and boards with meaningful global experience. Maintain intense sensitivity to local markets by, for example, promoting local nationals and making them responsible for more decisions. Resist the impulse to compete with larger rivals on their terms. Instead of mimicking their bureaucracy, exploit your agility and flatt er structure. • Focus on serving a relatively narrow technological niche. While mini-multinationals as a whole play across the technological spectrum, each focuses on competing in a core area of expertise. On the larger end of the size range, privately held Revstone group, for example, supplies large automakers like GM, Ford, Toyota, Volkswagen and Hyundai with castings, forgings, tools and precision machining. GrafTech International, based near Cleveland, manufacturers in four countries and sells its graphite electrodes to steel producers in 65. In other sectors, U.S. mini-multinationals are very competitive in sectors where they combine manufactured products with systems know-how. For example, Aeration Industries International of Chaska, Minn., sells water pollution control equipment in multiple countries, particularly China. While it might be easy for a competitor to imitate Aeration’s equipment, it’s much more difficult to develop the body of knowledge about how to use the equipment in particular circumstances. Some mid-sized American companies are also particularly strong in new cutting-edge technologies such as genomics decoding (Illumina); lithium ion batteries (A123 Systems); advanced surgical instruments (Intuitive Surgical); and software and services for mobile broadband systems (Tekelec). These competitors have helped create brand-new business sectors. His company has survived competition from giants like Cisco Systems, China’s Huawei and Sweden’s Ericsson by staying focused on the brains of the mobile broadband systems management by national operators such as Deutsche Telekom and France’s Orange. Its largest single market outside North America is India, where the vast majority of mobile Internet traffic touches Tekelec systems. One key to Tekelec’s geographic expansion has been piggybacking on the market presence of a systems operator. If Deutsche Tekekom operates in 20 countries, Tekelec can sell its product in all those markets by building relationships with DT headquarters. Some mini-multinationals infiltrate new turf by following their customers into new terrain. In fact, Revstone expanded largely because its largest customers demanded it. Ford Motors and General Motors are both opening new factories in countries such as India. Revstone also supplies the top German, Japanese and Korean automakers, which are extending their global reaches. “We try to follow and serve our customers,” says the company’s founder and chairman, George Hofmeister, who built the company from scratch through a series of acquisitions and recently turned over the CEO spot to successor Kevin G. Cramton, a former Ford Motors executive. Revstone now operates 71 factories in the United States, Canada, Mexico, China, India, Costa Rica and the Dominican Republic and is closing deals in Germany, Hungary, Saudi Arabia and the United Arab Emirates. Some 25 percent of its revenue comes from outside the United States. • Concentrate on remaining agile and entrepreneurial. “We are very nimble,” says Hofmeister. 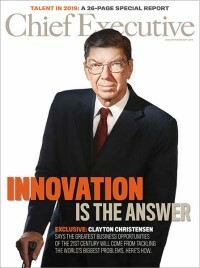 “We do everything we can to empower our people to make decisions and not wait for bureaucracies and committees on top of committees to make decisions.” At Revstone, he notes, the parent company imposes standards of accounting, quality, efficiency and financial reporting, but each factory remains its own profit center. That’s very different from how a standard multinational seeks to homogenize its disparate manufacturing operations. • Build management teams and boards that include non-Americans or recent immigrants and executives with international experience. Mini-multinationals by definition tend to have flatter managerial hierarchies, enabling them to be more sensitive to local market preferences and conditions than their larger, more top-heavy competitors, which tend to impose more policies from headquarters on their local operations. CEOs like Craig Shular, chairman and CEO of Parma, Ohio-based GrafTech International take that strength a step further by appointing local nationals to manage its non-U.S. subsidiaries whenever possible. “When we do put an expatriate into the field, we work hard to make that a limited assignment, a couple of years, to groom and develop the local talent and then move on,” says Shular, a veteran of Union Carbide who spent half his career living abroad. “We have huge operations in Mexico, Brazil, South Africa and Europe, but you’re going to find no expats. Nationals have the local language and local business skills, and they can engage with the business community better than any expat can.” GrafTech gives stock options to its foreign managers as readily as it does to its headquarters staff to increase retention and Shular also promotes local nationals to top management jobs at headquarters. His two key operating vice presidents, for example, are both South African. To be sure, not every mid-sized U.S. company that seeks to establish a global footprint makes it. Some simply fail to develop essential “global skills,” says Oded Shenkar, Ohio State professor of global business and a specialist in mid-sized companies. “They don’t have a tradition of working in other countries,” he says. “They don’t have a tradition of learning about other cultures and how to operate in those cultures.” Others fail at expanding because they were dragged into international markets before they were ready. Sometimes, says Shenkar, their largest customers tell them, “Listen, we don’t want to deal with 50 different suppliers around the world. Either you internationalize or we are going to do business with someone else.” Often, these wannabes “get acquired because they cannot muster the skills and the resources that they need to survive in the global environment,” he notes. However, for those that are ready, willing and committed to success, evidence suggests that there are ways for mini-multinationals to compete—and possibly even beat—larger competitors in global markets. Whether it be through intense focus on a core expertise or greater speed and flexibility, smaller companies can find and leverage an edge that enables them to operate better and smarter than the big guys do. The bottom line? Companies do not have to be giants to operate successfully on multiple continents. The Sales Dilemma: Agent or In-Country? At the early stages of simply exporting products, companies tend to find an established distributor of similar products with a multi-country footprint or hire independent agents to market, sell and distribute their products. Each of those approaches has positives and minuses. The plus side is that an exporter can get started with no or very little capital outlay. But an exporter can get lost in a big distributor’s entire portfolio of products. And agents can create performance problems—do they really have the incentive to maximize sales? That’s why many companies find, over time, that they need to establish a bigger presence in key markets. As they grow in size and capability, the American exporter can make a local acquisition and/or establish a local full-time employee base that may involve marketing, distribution, sales, testing, assembly and ultimately manufacturing. It is more expensive to take the next step of creating an in-country presence but it allows the company to have much better control over the product, it allows a much better understanding of the ultimate customer’s needs and it allows better financial controls. Ultimately, most CEOs argue that it is more profitable than simply exporting. Tekelec was founded in California but is now based in the Raleigh suburb of Morrisville, N.C. Some 60 percent of its $424 million in 2010 revenue came from outside North America and 40 percent of its 1,250 employees are based outside the United States. The company, whose CEO Ron de Lange is a first-generation Dutch descendant, specializes in the brains of mobile broadband systems around the world, meaning it sells mostly software and services, not hardware. The company’s focus and agility often allows it to outflank competitors of much greater magnitude. In the Q&A to follow, de Lange shares his strategies for competing globally against larger firms. Most everyone we compete with is a mega-multinational such as Cisco Systems, Huawei, Ericsson and Alcatel-Lucent. How can you beat those guys? We have offices in 20 countries and use a direct sales model. We have used local sales agents to introduce us to the key decision makers at telecom companies such as British Telecom, Orange and Deutsche Telekom. They may be operating in 20 to 30 markets. If we can get into their headquarters, then we can leverage their broad, geographic reach. We use other people we call fulfillment partners to actually service the accounts. We train them. Then we base our own subject matter experts around the world. This strategy has accelerated our ability to globalize, and we can keep some of our costs variable, rather than fixed. Why don’t the big guys simply crush you? We stick to our core competencies and we are very careful not to go outside them. We are specialists in a very niche part of the market, what is called the control plane of an operator’s network. We are the brains of an operator’s network, not the brawn. We connect all the organs of the body like a spinal cord, including the databases that they use to bill customers and protect privacy. We have a number of patents for doing all that; and, as we get feedback from the market, we can adjust our go-to-market strategies more quickly than the big guys can. How did you learn how to create such a global company? I had years of experience with Lucent and was based in Amsterdam and London for a period of time. Most of my management team consists of people who have done a tour of duty with the large multinationals. They’ve worked for Nortel, Lucent, Ericsson and other telecom companies as well as for software companies like Symantec. They’ve had the breadth of experience and they know how to do large-scale global growth. For example, we’ve done four acquisitions outside the United States in Amsterdam; France; the Czech Republic and Montreal, Canada. My board of directors also has two members who are non-U.S. and bringing that perspective is important. We’ve had sales conferences in different places in the world and we try to create a multicultural environment. Why would executives from larger companies want to work for such a small outfit as yours? Well, the Raleigh area has been named the best place to live in the United States. A smaller company also gives people an opportunity to move and grow. It’s amusing to see an engineer visiting Pakistan for the first time and bringing home candy as if it were so exotic. When you have 1,250 people, you get exposed to more and you can have a bigger impact on the business than if you are at a multinational where you are one person out of 100,000.
Business: Lithium ion batteries for customers like BMW, Daimler and General Motors. Multinational Presence: 28 percent of sales outside U.S. Global Strategy Strength: Started manufacturing in China and South Korea before U.S. to achieve scale, drive down costs. Business: Water pollution treatment systems. Multinational Presence: 50 percent of sales outside U.S. Largest market outside the U.S. is China. Global Strategy Strength: Located contract manufacturing in different cities in China to avoid piracy. Business: Graphite electrodes for the steel industry and new materials for advanced electronics. Multinational Presence: 80 percent of sales outside the United States; Sales in more than 65 countries. Operates 14 plants on four continents. Global Strategy Strength: Emphasizes hiring local nationals to manage foreign subsidiaries. Gives them stock and promotes them to headquarters. Business: Machines and equipment for decoding human DNA. Multinational Presence: 40 percent of sales outside U.S. Manufactures in Singapore among other locations. One of its largest customers is Chinese. Global Strategy Strength: Has largely prevented the emergence of non-U.S. competitors by rapidly rolling out its technology around world. Business: Makers of the daVinci minimally invasive surgical system. Multinational Presence: 25 percent of sales outside U.S. Offices in Switzerland and China, manufactures in Mexico. Global Strategy Strength: It is engaged in a classic roll-out of its core technology into adjacent fields and new geographies. HQ: Lexington, Ky. & Southfield, Mich.
Business: Supplies parts for GM, Ford, Toyota, Volkswagen and Hyundai. Multinational Presence: 25 percent of sales are non-U.S. Operates 71 factories around world. Global Strategy Strength: It grows by acquisition and allows each factory to remain its own profit center. Business: Makes titanium products for aircraft and offshore oil rigs. Supplier to Boeing and Airbus, as well as BP. Multinational Presence: 33 percent of sales outside U.S., including exports from U.S. Locations in Britain, France, Canada and China. Global Strategy Strength: Emphasizes that all managers of business units may call CEO directly for speedy decision making. Business: Mobile broadband software and services. Multinational Presence: 60 percent of sales outside U.S. Secondlargest market after North America is India. Global Strategy Strength: Maintains a tight focus on making the brains of mobile broadband systems, rather than the brawn.